Having impressive and mesmerizing interiors bathed in a heavenly blue light, the Santuario Dom Bosco (Sanctuary of Dom Bosco) honours the Italian saint of the same name who dreamed of a utopian city in 1883. Dom Bosco's vision was a major inspiration for the foundation of Brasilia. While inside, do check out the huge golden chandelier made of 7,400 pieces of Murano glass by architect Alvimar Moreira. How popular is Santuario Dom Bosco? People normally club together Parque Da Cidade and Parque Nacional De Brasilia while planning their visit to Santuario Dom Bosco. People also prefer to start their day with Santuario Dom Bosco. 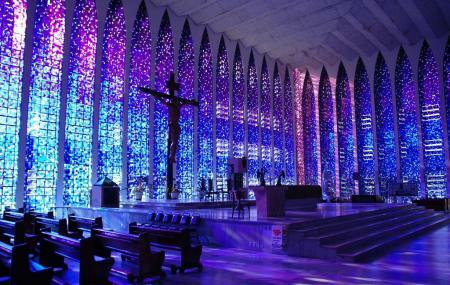 Amazing Cathedral in Brasilia. Love the great design. The most beautiful church in Brasilia with its blue windows and the huge crystal chandelier at the center of the ceiling.